Sit down to a new place setting which combines the timeless beauty of real wood and the soft surface of felt! Five Ply Design has designed PlaceMats to both protect your delicate table surface as well as keep you honest when eating with enthusiasm. Treated with food-safe oil, these PlaceMats will help keep you looking good through the most heated of dinner conversations. 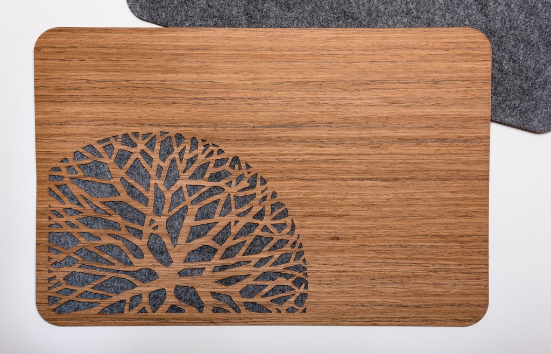 Constructed of 100% reclaimed wood which is finished with a food-safe oil and 100% reclaimed felt (made of 30% recycled nylon and 70% recycled wool) Five Ply Design PlaceMats are not dishwasher safe and require a moist towel to clean and dry immediately. Sold in sets of two.